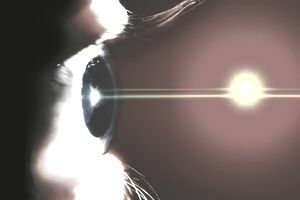 Laser eye surgery isn't covered by most medical insurance policies, but the Internal Revenue Service has some good news for you if you're thinking about having the procedure done. You can at least deduct the cost of the surgery on your tax return. According to IRS Publication 502 Medical and Dental Expenses, "You can include in medical expenses the amount you pay for eye surgery to treat defective vision, such as laser eye surgery or radial keratotomy." Unfortunately, when it comes to taxes, it's never quite that simple. First, it can help to define LASIK surgery so you know whether your procedure qualifies. Laser-assisted eye surgery or vision correction is a refractive surgery most often done on an outpatient basis. It's commonly used to correct nearsightedness, farsightedness, and astigmatism. A laser is used to reshape the cornea—the round dome located at the front of the eye. This enhances the way the eye focuses light onto the retina at the back of the eye and improves vision. Payments for legal medical services rendered by physicians, surgeons, dentists, and other medical practitioners. The costs of equipment, supplies, and diagnostic devices needed for these purposes. By completing Schedule A, you will have arrived at the total of all your itemized deductions. You would then enter this number on line 40 of your Form 1040 tax return in lieu of the standard deduction. As of 2017, the standard deduction for a single taxpayer is $6,350, so you would need at least $6,351 in overall itemized deductions to make all this worth your while. And if your total is $6,351, you'll save just pennies on your taxes, literally 25 cents if you're in the 25 percent tax bracket. Unfortunately, you won't be able to claim all your medical expenses when you're coming up with that total of itemized deductions for line 40 of your tax return. Medical expenses are only deductible to the extent that they exceed 10 percent of your adjusted gross income or AGI. You can find your AGI on line 37 of your 1040. If your AGI is $65,000, you can only deduct your medical expenses that exceed $6,500. In other words, if your total medical expenses for the year are $7,000, you can claim a $500 deduction with an AGI of $65,000—not necessarily the entire cost of your LASIK surgery. Travel expenses incurred to get to and from your surgery. This includes bus, train, or cab fares, as well as the price of gasoline if you have someone drive you there. In-hospital food and lodging if you are required to stay overnight following the surgery. Check with an accountant before making the decision to get costly surgery solely with the expectation of writing it off on your taxes. As a general rule of thumb, if the total amount of your itemized expenses is greater than the standard deduction for your filing status, itemizing is a good thing. If the total itemized amount is less than your standard deduction, you'll probably want to forego claiming a deduction for the surgery. Check with an accountant to explore all the itemized deductions that might be available to you. The largest deductions for most people who itemize come in the form of mortgage interest and property taxes, so it could put you over the standard deduction amount if you own your home and have even a modest mortgage—before you factor in how much your surgery will cost you over that 10 percent threshold. What's the Investment Interest Expense Deduction? Can You Claim Your Baby as a Dependent on Your Taxes?